Voost actively leverages Spot Instances to reduce costs by up to 50%, and it has made them more focused on development through the benefits of managing with solutions from AWS technology partners such as Spotinst. Voost is a startup that specializes in the development of a digital asset management platform. It has developed 'Pastel' which integrates the account information of the cryptocurrency exchange and allows users to place orders without visiting the exchange. Pastel is a SaaS-based platform that allows users to manage all their cryptocurrency exchanges in a single UI (User Interface), enabling the users to view and analyze multiple distributed assets in one place. Voost's digital asset management platform is designed to help secure transactions for professional cryptocurrency traders and businesses. After Voost was established in May 2018, in order to develop a digital asset management platform, we had to consider both the business and the technical aspects as well, Given the characteristics of digital asset management, reliable service is the most important factor for Voost. Though it was possible to build servers in IDC to ensure stability, it was not easy to have professional management personnel to operate large-scale services, and crucial problem was that the estimated costs were too expensive. In addition, due to the nature of startup, we had to develop and operate at the same time with limited staff, so the best choice for creating the best products with limited staff and cost was the cloud. Voost chose AWS with service stability and global market in mind. In addition, we judged that AWS would be a good way to provide reliable services while supporting DevOps environment as Voost desired. 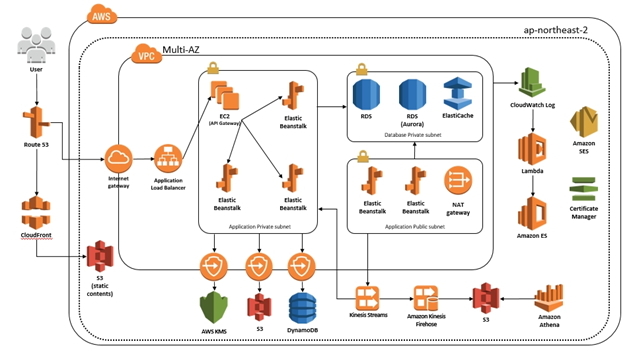 AWS has the advantage of being able to instantly use a variety of server configurable templates and a variety of services such as Amazon Elastic Compute Cloud (EC2), Amazon Relational Database Service (Amazon RDS) , Amazon Aurora, Amazon Kinesis, and Auto Scaling. The fact that most cryptocurrency exchanges are using AWS is also one of the most important reasons for choosing AWS. Byeong-Seong Park, CTO of Voost, who is a certified AWS ‘Solutions Architect Professional’, said, "I've been using AWS for a long time since I worked at Samsung Electronics and I was already familiar and satisfied with AWS's wide range of services and features. We decided to go from development to testing, stabilization, and production with AWS since the start of business, because of the super fast speed at which we can respond to our clients and instantly service them." 'Pastel' needs to collect large amounts of data from exchanges by connecting to global exchanges, so it has to maintain a large infrastructure from the very beginning of service. If we were to use this large infrastructure on-demand in AWS, infrastructure costs would be too high. Considering AWS's cost optimization options, Voost decided to take advantage of the Amazon EC2 Spot Instance, which can save up to 90% in cost over on-demand instances. Spot Instances have helped to make AWS's resources more flexible in terms of cost optimization using Auto Scaling by starting, managing, and maintaining application availability, and taking advantage of Spot Instances based on customized conditions and peak quotas. The following diagram shows the basic architecture of Voost. We are currently running a beta version of 'Pastel' on AWS. Voost enabled us to take advantage of Spot Instances and reduce costs by up to 50%. In general, a Spot Instance has the advantage of being able to save up to 90% over the on-demand price through the highest price the clients are willing to pay, but it can be terminated within two minutes notice when the market price exceeds the maximum price you specify. As a complementary measure, spot prices have stabilized since December 2017, and the stable progress of spot prices can be shown through Pricing History. In addition, the Spot Block option and the Spot Fleet option allow uninterrupted use for up to six hours, as well as the ability to combine different instance types. Since the information that can be used to figure out the interruption frequency of each instance is provided through Spot Instance Advisor in advance, we were able to reliably use the service. Byeong-Seong Park, CTO of Voost, said "Besides, we are more than satisfied because it offers management benefits with the solutions of AWS technology partners such as Spotinst. There is a difference in the cost depending upon how to use AWS. The benefit of AWS's cost optimization is that it not only makes infrastructures more affordable, but it also allows to build the environment freely with AWS technology partners' solutions to suit user requirements." Pastel will be conducting public beta testing for many users from February. As a result, since the demand for log data collection and computing resources will be increasing, we will resize the cost-effective instance size for Amazon EC2 and RDS and use the AWS Reserved Instance to optimize the costs against on-demand usage. We will operate the service more reliably at a lower price. Dong-Joo Lee, CEO of Voost said, "Blockchain technology has many possibilities. In particular, it is expected that the role of the Blockchain in financial services will become larger and more efficient. We are now starting as an asset management platform, but we want to take the role of expanding the middle level so that not only the cryptocurrency but also the existing financial sector can be transformed as a whole. My desire is that the Block-chain will change the banking system and serve as a catalyst to induce support, investment and awareness change from the government."